When we are drawn to having an Aura-Soma reading we are faced with 105 beautiful jewel-like bottles. We need to pick four bottles from this selection for the practitioner to do the reading. We always say that the eyes are the windows of the soul and so we make our connection through the eyes to the bottles and these speak directly to our soul. The soul recognises the colours and their meanings at a deep level that we normally might not recognize and so we pick our bottles. 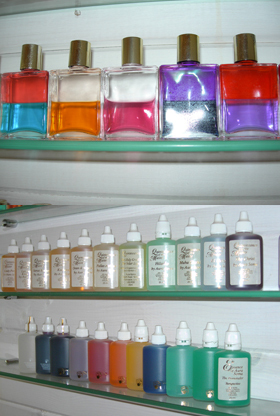 The Equilibrium bottles are used for readings and consist of dual coloured bottles (although some bottles do only contain one colour). The bottles contain living energies through crystal energies, colour, herbs and essential oils. The top fraction is oil based while the bottom fraction is water based and carries energies from the Glastonbury Well. To some degree, as human beings we do grow through life and learn various lessons. With Aura-Soma we can learn the lessons a lot quicker and enjoy life with a new degree of consciousness and the knowledge that we are in a position of co-creator and we can accept that we are in more control of our lives than what we initially thought. During a reading you are asked to choose four bottles from the full set and these four bottles represent your mission and life purpose, your gifts and talents, the here and now and the possible outcome or future based on the rest of your colour selection. It is suggested that you take away your gifts and talents bottle (sometimes a different bottle may be recommended) to apply to the skin and this will help you to see your obstacle in a different way and help you to turn it into a gift. This is called "working with your bottle"
The personality is like an onion and as you peel away the layers of the onion so the next layer will present itself. By peeling away the layers it helps us get in touch with who we really are after the filters and judgments have been taken away. There are of course other products as well. The pomanders help to protect your aura and environment for up to 2 hours and the quintessences assist us in developing characteristics in ourselves and also offer loving support when working through a challenge. "You are the colours you choose and these reflect your being's needs".